How’s this for a modern-day adventure, although with a tip of the hat to a golden oldie? 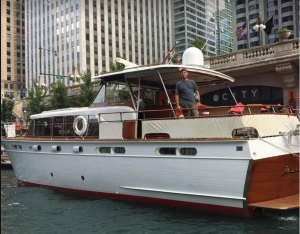 Albert Bartkus and Cindy Chebultz have joined a growing number of cruisers who are taking on the Great Loop, and they’re doing it on a classic 1960, 50-foot wooden Chris-Craft Constellation named MissMarianne. And to prove they’re totally up to date, Cindy is taking pictures and posting them on their blog, lifeofacaptain, just about every day. If you live east of the Mississippi River, technically, you live on an island. Every year around a hundred boats prove this point by completing a circumnavigation of the entire eastern U.S. The path, called the Great Loop, is a continuous waterway connecting lakes, rivers, sounds, canals, the Gulf of Mexico, the Atlantic Ocean and the Atlantic Intracoastal Waterway. According to America’s Great Loop Cruisers’ Association, at any time, about 300 “Loopers” are tilting at the full circle of about 5,000 miles — or more depending on specific route choices and side trips. There are no real rules about where to start or a prescribed timeline. Most Loopers take a counterclockwise circuit heading north in the spring, often from Norfolk, Va., where they meet for a rendezvous and seminar (this year’s runs from May 2-5). Looping can be a social affair, and the rendezvous serves as a gathering point to meet other travelers. From Norfolk, the cast of characters heads north through the Chesapeake, briefly outside into the Atlantic and into the Hudson River. The next leg goes through the Erie Canal and on to the Great Lakes where many Loopers spend the summer months. In the fall, the boats flock downstream with the Illinois and Mississippi Rivers and cross to Florida in November after hurricane season has passed. The Atlantic Intracoastal Waterway completes the circle, a beautiful but often challenging route that runs from the Florida Keys back to Norfolk. While it’s possible to make the run from Florida to Virginia entirely in inside waters, many boaters make longer hops offshore in the Atlantic, bypassing a tight cluster of drawbridges in South Florida or the infamous tidal swings and resulting shallows in Georgia. However, there are trade-offs to consider. The array of challenges along the Great Loop includes busy ports, heavy commercial traffic — especially in the Mississippi — capricious weather, changing seasons, scheduled bridge/canal openings and, inevitably, equipment failure. However, the satisfaction of conquering 5,000 miles of waterway will be surpassed only by the incomparable experience of navigating at school zone speed through golden marshlands, lush riverside forests, vast lakes and bays, storied rivers and dazzling city centers. Ask Loopers about their favorite stretch, and you’re likely get a different answer from each. Some love the small-town life on display along the Mississippi, while others relish the Florida sunshine or the majestic beauty of the Hudson River Valley. But there’s more to it than the scenery. Simply setting off to traverse the Great Loop separates the dreamers from the doers. It’s easy to get snagged somewhere along the mammoth to-do list that must be ticked off before an extended Loop adventure. One of the toughest obstacles is choosing the right boat for you and your crew. The Great Loop has been attempted in everything from a kayak to 70-plus-foot boats, but there are a few critical restrictions on vessels that can complete the circumnavigation. Some parts of the route get a tad shallow, so a draft of six feet or less is necessary to stay afloat. And speaking of low points, one stretch between Chicago and the Illinois River has a fixed bridge with only 19 feet of clearance. For that reason, sailboats are not optimal Loop boats, although many sailors drop their masts and carry them onboard or ship them to be picked up down the way. Finally, the route includes long stretches with no services, so a vessel needs fuel tankage (or a collection of jerry cans) to allow traveling from 250 to 500 miles between fill ups. There are plenty of boats that meet this criteria, for some too many. How much: As with any undertaking, there is a low range (think backpackers) and a first-class option (think five-star hotel). Boats can range from $20,000 to over $100,000. Fuel efficiency and fuel type are major budget factors. 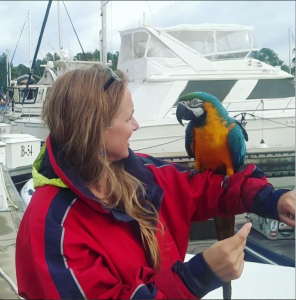 Marinas charge by the foot, so every foot of length is a trade-off in dockage expense. Refitting can be costly, so cruise readiness should be considered. Dockage: $8,000 to $28,000, average range: $1 to $2 per night/per foot. Factors: Size of boat and your willingness to find and use free anchorages. Total cost: The average trip is in the $50,000 to $60,000 range. 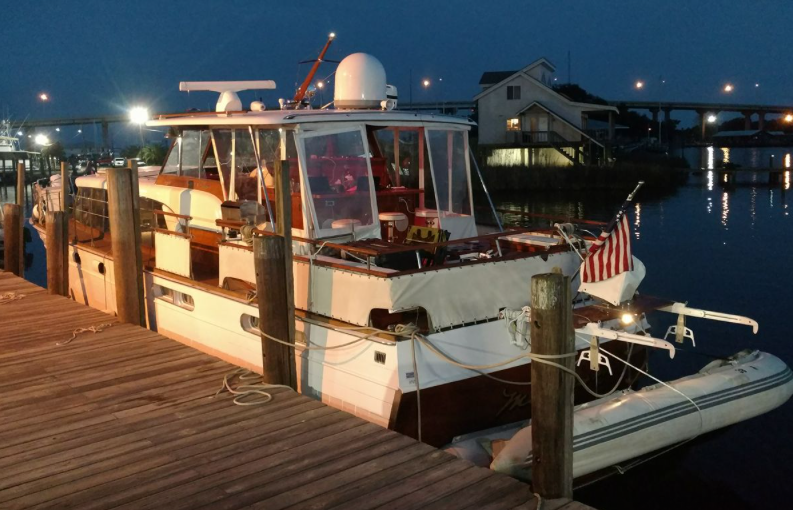 The lower end is around $35,000, while a big boat with a splurging budget can run $150,000+.